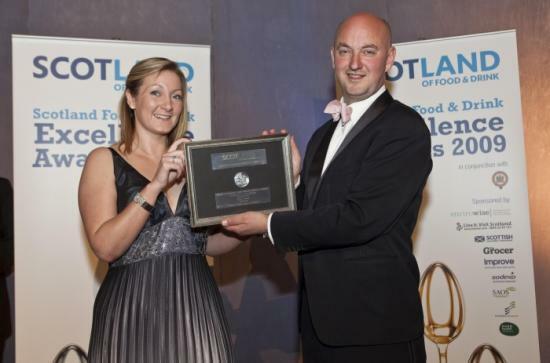 Caithness company, Berry Good were absolutely delighted with their very first award from the Scottish Food and Drinks Excellence Awards held recently in Glasgow. The awards which are hailed as the 'oscars' of the Scottish food and drink industry were held on the 7th May in the Kelvingrove Art Gallery. The company which is run by Jill Brown of Watten have only been running since June 2008. The judges were delighted with the product and felt that it really has the 'wow factor'! The product is distributed throughout Scotland & UK through Elgin based Gordon & Macphail. Berry Good uses no artificial colours or flavours. Only real fruit from Caithness berry growers makes into the high quality drinks "Straight Strawberry" and "Real Rasperry". An amazing taste with all the freshness of local produce adds to the experience. The finest talent in the Highlands and Islands food and drink industry gathered in Inverness on Friday (25th October 2013) to celebrate this years Highlands & Islands Food & Drink Awards. It was a nail-biting finale as 41 businesses awaited the announcement of the winners of 12 awards, with victorious businesses ranging from breweries, bakeries, restaurants and retailers to producers of premium Scottish seafood, salt and cheese. Berry Good is a new Caithness business that is focusing on producing quality fruit flavoured vodka. Using strawberries and raspberries which are infused with a top quality vodka produces a bright coloured drink that's bursting with berriness! Straight Strawberry and Really Raspberry are two flavours which are in production but the business hopes to expand its range of spirits and flavours in the future.